Bona created high quality polishes that add a durable protective layer, fill in micro-scratches, even out the appearance of high traffic areas and provide a beautiful shine. Making your floors and your home beautiful. An important part of hardwood floor maintenance, learning how to polish hardwood floors yourself adds extra beauty, shine and longevity to your floors. Applying polish on hardwood floors helps to restore a floor’s protective layer of finish and is a simple project that can be done by most people. Learning how to polish hardwood floors yourself is a relatively quick, cheap and easy way to properly maintain hardwood floors. It’s important to know the difference between polishing a hardwood floor and refinishing one. Both tasks are similar, but when you polish a hardwood floor, you are keeping the finish that is on the floor intact—polishing a hardwood floor restores a floor’s existing finish, filling in microscopic scratches and evening out the appearance of the floor. When you refinish a hardwood floor, you are completely removing the floor’s existing finish and replacing it. This task should be left to the professionals. How Often Should I Clean and Polish My Floor? Cleaning as often as you want will help minimize the dirt and dust on your floors that can act like sandpaper and wear your floor. Bona’s line of specially-formulated polishes can be used multiple times per year. Frequency of use depends entirely on the amount of traffic your floor sees, but typical homeowner floor maintenance is every two to three months. How Long Will Cleaning and Polishing Take? The length of time to clean and polish depends on the size of your wood floors. 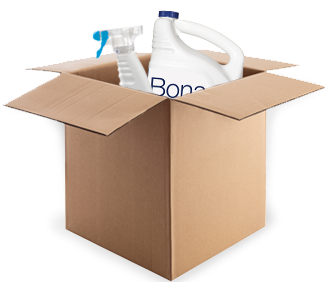 It is a very quick and easy process when using Bona Cleaner and Bona Polish. Bona Polish provides a protective layer and evens out the sheen. It is an incredibly simple DIY project. No special equipment is needed. Simply remove furniture and rugs, then sweep, vacuum or dust mop your floor, and give it a wet cleaning with Bona Hardwood Floor Cleaner. Then squirt Bona Polish (available in either a high or low gloss formula to suit your tastes) onto the floor, spread it with an applicator and allow it to dry. Let it dry one hour before you walk on it, and 24 hours before subjecting it to heavy traffic. Before you’re ready to polish your hardwood floor, the room must be properly prepared for hassle-free experience. 1. Remove all furniture and belongings in the room. Clear the area. Be cautious when moving large objects and furniture. If possible, use furniture pads to help protect the floor from accidental scratches and gouges. 2. Give the floors a good clean. Dust and mop your floors. Make sure the floor is completely dry before applying the polish. For more information on this, read our article on cleaning hardwood floors [link to cleaning article]. If necessary, discreetly test the polish on a small portion of the floor. 3. Make sure you have all the right tools. Polishes can be applied with the Bona applicator pad, Bona Microfiber Cleaning Pad or a high-density foam roller. Check the polish instructions to make sure you have all that you need to finish the job. When you’re ready to polish your hardwood floor, have a predetermined plan and give yourself some peace of mind. 4. Work in small sections. When applying the polish to your hardwood floor, work in small sections to keep the applicator pad/roller wet. Be sure to smooth out the polish along the grain of the wood. 5. Use a feathering technique. To avoid stripes of uneven polish on your floor, take a cue from interior painting and feather out the polish so that you have smooth transitions as you move from section to section. 6. Plan your exit. Make sure you don’t paint yourself in a corner. Know in advance how you’re going to break up the floor. If possible, have a helper apply polish along the perimeter of the rooms while you follow close behind. Once you’re finished, allow at least one hour for the polish to dry before the floor is exposed to light traffic. The polish should dry completely after 24 hours, making it ready for heavy traffic. Polishing your hardwood floor is recommended every few months, but this suggestion will vary based on how much foot traffic the floor experiences. 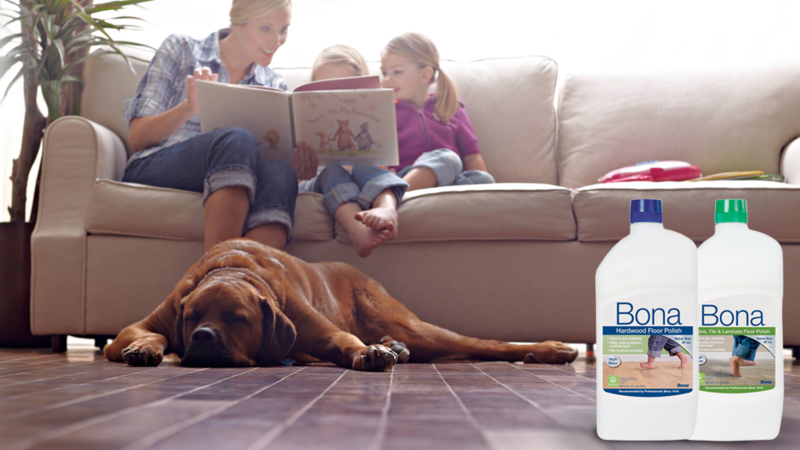 Bona offers floor polishes and tools for hardwood, stone, tile and laminate floors. Bona Hardwood Furniture Polish and Bona Cabinet Cleaner are also available to keep the rest of your wood belongings looking beautiful. Take a look at our selection of polishes to find the right product for you.